(CNN) -- When Susannah Reid learned she had an extremely rare and aggressive cancer at age 41, she was hit with a double whammy. Susannah Reid, left, benefited when her sister Beth Weiss found a fellow patient on a cancer-centric site. She was told that no doctor in her home state of West Virginia had much experience treating it. Then when her sister found an expert out of state, her insurance refused to pay for treatment there. "I was panicked. I cried for 36 hours straight," says Beth Weiss, Reid's older sister. "My sister has an 8-year-old child and a disabled husband." 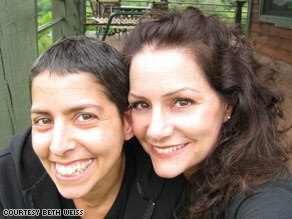 Late one night, Weiss went online looking for information about her sister's disease, uterine leiomyosarcoma. And there she found the woman she calls her "godsend," Dr. Doreen Kossove. Kossove, a pediatrician, also has advanced leiomyosarcoma. Tethered to an oxygen tank, writing from the hospital bed that's been set up in her apartment in Berkeley, California, Kossove goes online several times a day to offer guidance to others on ACOR.org, home of the Association of Cancer Online Resources. "Susannah never would have gotten the quality of care she has if not for ACOR and Dr. Kossove," Weiss says. "It's absolutely been helpful," Reid said. "First of all, it gives us information about people who are going through what we're going through. You can go through medical history and find people in your exact situation, doing the same kind of chemotherapy and you can see what other doctors are saying." "It's helpful on an emotional level. There's a lot of support on the thread and there's the comfort of knowing you're not the only one." Reid finished radiation therapy and said she's doing "all right." Her last scan in August showed the tumor was not spreading. Internet experts say ACOR is one of several "social networking" sites where patients learn from one another -- and that these sites have never been more useful. "In this day and age, a lot of doctors may be rushed and can't spend a lot of time with their patients, so the onus of responsibility has shifted more towards the patient" says Dr. Kevin Pho, an internist in Nashua, New Hampshire, who blogs at kevinmd.com. "On these Web sites, patients can feel empowered talking to other patients who are going through the same issues." So, how do you know which are the best social networking sites? CNN asked several experts, including Matthew Holt and Dr. Indu Subaiya, co-founders of Health 2.0, which connects patients with information, software and community, to name some of their favorites. Holt, Subaiya, and others say this site is one of the leaders in the field. They give it kudos for creating large communities and offering tools for patients to compare symptoms, effective drug dosages and side effects. One strength of this Web site is that physicians who are experts in their areas moderate many of the forums. Doctors and patients work together to create "wikis," or documents that can be edited by any user. "This is one of the few sites I know of where patients and the experts are all part of one community," Subaiya says. On this Web site, you can use online tools to set goals, send "hugs" to other patients, and vote on the effectiveness of treatments. "It's not just about support," Subaiya says. "You can go on and see what percent of the time has a certain drug worked for people like you." Surveys show most people get their medical information simply by putting a term into a search engine such as Google. While that can be useful, it can also bring up information of questionable accuracy and value. On organizedwisdom.com, physicians and lay experts create "wisdom cards" tailored to thousands of search terms, giving readers a vetted version of health information. The Association of Cancer-Online Resources, where Weiss found Kossove, is home to 159 mailing lists for people whose lives have been touched by cancer as well as information on cancer treatment options, lists of clinical trials and other support resources. Founded in 1996 by Gilles Frydman, who'd watched his wife battle cancer, the Listservs have been used by more than half a million people to share advice and affirmation about fighting cancer.